A University of Wolverhampton Degree Apprentice has been shortlisted for a top award in recognition of her hard work. Ruksana Kavde is currently studying for a Chartered Manager Degree Apprenticeship (CMDA) at the University, alongside her role as Information Officer within the Virtual School team at Walsall Council. She is a finalist in the Asian Apprenticeship Awards 2018 in the Charity, Voluntary Organisations and Public Services category. Ruksana, from Wednesbury, started the Apprenticeship with the University’s Faculty of Social Sciences in January 2018. 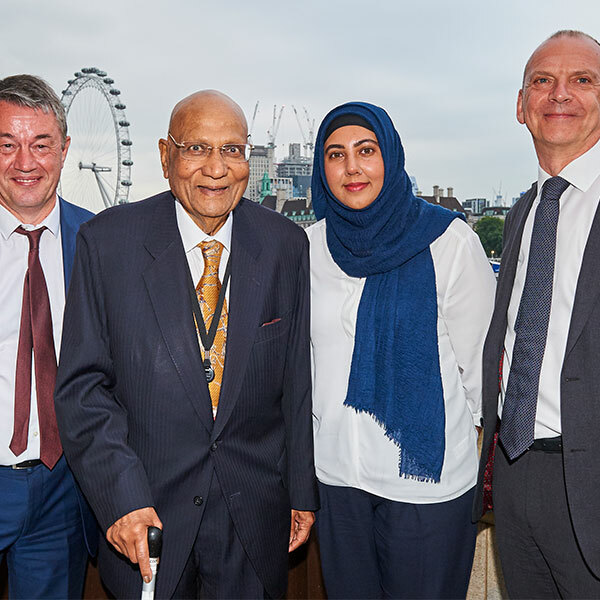 She joined the University at a House of Lords reception in May to celebrate Apprenticeships, and spoke about the experience of studying alongside her work and family commitments. The winners of the Asian Apprenticeship Awards will be announced at a ceremony in Birmingham on Thursday, 29 November 2018. Picture: (l-r) Mark Price, Director of Apprenticeships (Business), Chancellor of the University of Wolverhampton the Rt Hon Lord Paul of Marylebone, Ruksana Kavde of Walsall Council and the Vice-Chancellor of the University of Wolverhampton Professor Geoff Layer at a reception at the House of Lords to celebrate Apprenticeships.